SINGAPORE: A high-speed rail can be expected to run from Jurong East all the way to Kuala Lumpur, Malaysia, in a decade. In just 90 minutes, the 350km rail line will be able to take travellers from Singapore to the Malaysian capital. A memorandum of understanding on the project was signed two weeks ago and the two countries are working towards signing a legally binding bilateral agreement later in the year. Apart from the economic benefits for both countries, the project will also open up a new avenue for leisure travel, such as weekend or day trips. Seven stops along the proposed line - Iskandar Puteri, Batu Pahat, Muar, Ayer Keroh, Seremban, Putrajaya and Kuala Lumpur - are in Malaysia, with each location offering something distinctive to travellers searching for a thrill or a mouth-watering local delicacy. Malaysians say they are eager for the rail to be constructed. Mr Firdaus Ahmad, 27, who has been selling chicken at the Pasar Awam dry and wet market in Batu Pahat for 10 years, says: "I welcome all Singaporeans to Batu Pahat. There is delicious nasi briyani here, with chicken. They will love it." Formerly called Nusajaya, this township is the administrative centre of the state of Johor. Tourists can have fun at the theme parks here, as well as take in beautiful views at its harbour. Fans of Thomas the Tank Engine will love this family-themed indoor attraction, which also features his friends, such as Bertie the Bus and Harold the Helicopter. Attractions include a Knapford station train ride and a windmill ride. Admire the luxurious yachts at this harbour, known as the jewel of Iskandar Puteri. It is surrounded by fine-dining and alfresco cafes, and Puteri Harbour International Ferry Terminal is located here. This bar and restaurant at Hotel Jen Puteri Harbour, serves a signature burger (RM38, S$12.70) with a 200g Angus beef patty, Swiss cheese, onions and barbecue sauce in between a split brioche bun. It comes with truffle fries. This hotel in Legoland Malaysia Resort opened in 2014 and has 249 Lego-themed rooms. The lobby features a towering Lego-inspired knight's castle and pirate ship. A premium room, which can sleep up to five people (maximum three adults) costs RM1,700 a night. Johor Baru City Centre is located north-east of Iskandar Puteri, about a 25-minute drive away. Located in the state of Johor, its name means "chiselled rock" in Malay. According to legend, Siamese soldiers once camped here in the 15th century, around the time they attacked Malacca, and chiselled rocks to collect drinking water. It is a bustling place with wet and night markets, a waterfront temple and several malls and hypermarkets. This landmark, which is surrounded by a park, shows two hands holding a mallet and a chisel, depicting the origin of the location's name. This Taoist temple by the sea boasts stunning views and is very popular among locals. There are two ponds containing arapaima fish and devotees like to gently touch the fish, believing this brings them luck and fortune. This recreational park in Jalan Sejati is the perfect spot for some quiet family time. 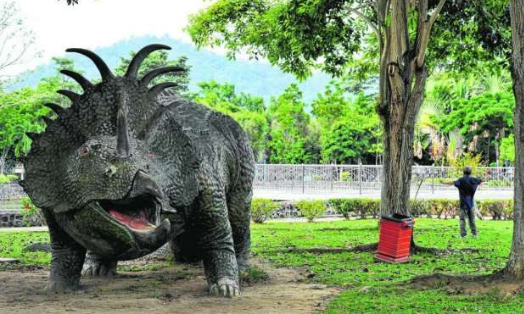 It has several play areas and two giant dinosaur replicas, which are a hit with children. It also has rest huts for picnics and exercise equipment for fitness buffs. Opened in 1987, this stall at Kompleks Niaga Benteng Peserai sells more than 500 plates of nasi briyani a day. A plate of chicken briyani costs RM6.60, while a plate of mutton briyani costs RM7. In the dry market, you can buy vegetables such as salted cabbage (RM4.50 a kg), eggplant (RM7 a kg) and cucumber (RM3 a kg). In the wet market, you can get fish (RM25 a kg), beef (RM24 a kg) and chicken (RM8.90 a kg). This romantic resort is built on a jetty stretching into the Strait of Malacca and six of its 11 rooms have stunning views of the water. In some rooms, part of the floor is made of glass, allowing guests to see the sea below them. Kluang is north-east of Batu Pahat, about a 55-minute drive away. This food heaven in the state of Johor is famous for its otah, oyster omelette, mee bandung Muar and coffee. This 385m-long bridge across the Muar river opened in 1967 and replaced the old ferry services across the river. One end of the bridge takes motorists to Malacca, while the other takes them to Batu Pahat. Open since 2006, the stall in Jalan Haji Abu is run by Mr Tuie Boon Ping, 25. He makes the otah from fish (RM0.70 a piece) and prawn (RM0.80 a piece). Buy 10, get one free. He also sells frozen otah in 180g packets, with prawn (RM6.50), clams (RM7), sotong (RM7), crab (RM8) and fish (RM6). This stall in Wah San Cafe in Jalan Abdullah serves Mee Bandung, noodles with bean sprouts, beef, tofu and egg, all covered with gravy made with prawn and chillies. The stall was opened by the late Hanifah Yusof in 1930. His son, Mr Abu Bakar, 66, and daughter-in-law, Madam Sabariah Salleh, 54, are now in charge. This cafe in Jalan Maharani has air-conditioned and open-air sections. It is famous for its coffee. A cup of Elephant bean coffee (1960s) costs RM3.40 (hot) or RM4.80 (cold). Opened in 1961 by the late Tan Ah Mat, the shop in Jalan Maharani is now run by his son, Mr Tan Soon Sam, 80. It sells a wide range of products such as traditional biscuits, ikan bilis, onions, dried sotong and dried ikan kurau. A town situated on the outskirts of Malacca, Ayer Keroh is a sleepy backwater. Apart from its rustic charm, attractions such as a zoo, bird park, planetarium and several theme parks are enough to occupy visitors for a few days. This theme park in Lebuh Ayer Keroh showcases the traditional houses from every state in Malaysia, such as the Perlis long-roofed house, a traditional Malay-style house that is fast vanishing from the landscape. Here, you can learn how to play congkak, a two-player game involving a wooden board with stones. Other activities include cultural shows, batik painting, Malay kueh-making demonstrations and horse-riding. Opened in 2010, this water theme park is filled with two million litres of water and has more than 12 attractions such as a tornado chaser, adventure island, crazy slide and wave rider. The adventure island, for example, combines eight slides and a water dump waiting to drench anyone in its way. Get grilled mackerel or torpedo scad fish at this restaurant in Jalan TU 40, Taman Tasik Utama Ayer Keroh. Wash it down with laici kang drink, which contains lychees, peanuts, chendol, red dates and grass jelly. At this shop in Medan Kraftangan, Taman Botanikal, buy belacan at RM3 to RM4 a bag. The shrimp paste is used for seasoning in dishes such as fried rice, and is made from prawns which are blended, compressed and dried in the sun. This shop in Lebuh Ayer Keroh has been operating since 2001. The owner, Mr Mohd Ali, 60, creates personalised souvenirs such as door signs and holders for pens and keychains, decorated with paint. The shop also sells necklaces, food covers made of rattan, handheld fans, wind chimes, teapots, candlestick holders, model ships and blowpipes used by the indigenous orang asli for hunting. This three-star hotel in Jalan Malacca International Trade Centre Prima 1 has 165 rooms. Malacca City is about 13km south-west of Ayer Keroh. The capital of Negeri Sembilan is just a 70km drive from Kuala Lumpur, so many of the residents here commute rather than relocate to the Malaysian capital or its suburbs. This has helped Seremban retain its youth, leading to new townships, namely Seremban 2 and 3. The expansions have made the town busier in recent years, but many of the famous old spots are still alive and vibrant. Weekend visitors, beware - it may be a small town, but be prepared to wait in traffic and queue at shops. The Then Sze Koon Temple is located on Temiang Hill and overlooks the town. It derives its nickname from the large number of centipedes that used to roam around the temple and a giant centipede sculpture commemorates this. This well-maintained museum honours Negri Sembilan's last ruler, who reigned for 42 years before he died in 2008. Of interest to history buffs are the sections explaining how the state is the only one in Malaysia to feature an elected monarchy. Stall number 748 at the Seremban Wet Market is an institution. Its unique dry noodles is bathed in a sweet sesame sauce. This humble-looking bakery serves buns which are filled with char siew, and other pastries. There is often a wait for the madeleines. Also try the kaya puff and egg tart. Located in the Seremban 2 township, it offers more than typical sandalwood products such as joss sticks and beads. Intricately carved decorative items and essential oils are available for delivery to Singapore. The Dusun, half an hour by car from Seremban, is an interesting choice. The nature resort is set on a hill with great views from the bungalows and infinity pool. Probably the closest thing to a business hotel that Seremban has to offer. It is a stone's throw from the town centre and is a strategic spot for people planning to see as much of Seremban as possible. Said to be the largest show farm in South-east Asia, Jelita is 9km from Seremban. Visitors can pet, feed and ride the feathered creatures. Roughly a 40-minute drive south of Kuala Lumpur, Putrajaya was built as the government's administration centre, with Islamic architecture outlining the town's landscape. From government buildings to mosques to public squares, Putrajaya portrays the grandeur of space as the country's administration hub. The pink mosque facing the manmade lake was built with inspiration from Iran's Safavid architecture. Several bridges have become scenic spots for wedding photography, including Seri Wawasan, Seri Saujana and Seri Gemilang. Tourists have a choice of several activities offered at the lake, from a leisurely cruise to flyboarding. The hot weather means it is best to visit in the morning or evening, with the sunset casting its rays on the water and a view of the mosque, with the imposing Perdana Putra - which houses the prime minister's office - in the background. Located in the Pullman Putrajaya Lakeside Hotel, the restaurant offers diners a view of the lake and is suitable for those who are on a leisurely holiday. Food options are rather limited in Putrajaya, but Serabei serves Malay dishes cooked in the Kelantanese style. Most tourists stay in Kuala Lumpur, spending only several hours in Putrajaya for the sights. Located atop a hill near the government administrative buildings, this hotel is convenient for business travellers meeting state officials. For those who want to enjoy fresh air and be away from the hustle and bustle of a city, this hotel offers quiet and calm. Home to the Formula One race that takes place once a year here, the track also hosts the MotoGP and the A1 Grand Prix. The city's name means "muddy confluence" in Malay, thought widely to have originated from the muddy confluence where two big rivers met in the old quarter of Kuala Lumpur. Today, the city, filled with skyscrapers, is the capital of Malaysia. Facing Merdeka Square, it is one of the few buildings with the neo- Mughal architecture built during the colonial era. Other buildings in the city built with similar architecture are the railway station, old city hall and Jamek mosque. The Twin Towers have become a symbol of modern Malaysia. Located nearby, the KL Tower is built next to a small forest reserve. Fifteen minutes away by car from the city centre is this temple with hundreds of red lanterns hanging over an open space. Located on a hill, it offers visitors a view of the city while its multi-tiered tiled roofs provide a resplendent background for photo-taking. The restaurant, which serves Hokkien Mee cooked over a charcoal fire, has been operating for more than four decades and its fish cake is a must-try. Locals were upset when KL's oldest coffee shop had to close in 2014 because of development. But it reopened in a new location and continues to serve its famous Hainanese Chicken Chop. The family-run shop has been operating since 1928. A simple Chinese restaurant serving basic dishes, the charm of Sek Yuen comes from its old-school chairs and setting, as it has been operating since 1948. Many say this restaurant serves the best banana leaf rice in town. Expect queues during lunch hour. Drinks at one of Asia's top 10 bars can be a cosy and unpretentious affair. At this small basement bar in Ampang Bangunan Ming Annexe along Jalan Ampang, the intimate experience of enjoying a customised drink bests other more glitzy bars. Other notable bar experiences are at PS150 in Chinatown and Kinugawa in Damansara. Wood carvings and two-dimensional art pieces from this store focus on buildings, animals and plants that are representative of Malaysia. Dozens of hotels are located within the city, from the six-star St Regis to colonial-style Majestic Hotel to backpackers' inns in Chinatown. Several night markets operate on different nights in the suburbs. Some famous ones known for their hawker food are in SS2 Petaling Jaya (Monday), Sri Petaling (Tuesday) and Taman Connaught (Wednesday). North of the city lies the Hindu temple. Visitors need to climb 272 steps to reach the cave's interior. Hiking has become a favourite pastime for locals. Bukit Tabur, less than 500m high, is one of the most popular spots as its peak provides a pristine view of a lake surrounded by forest - a gem in a city that is constantly bustling.